Hooray for separates! This coming year I’m going to sew less dresses and focus on separate pieces. 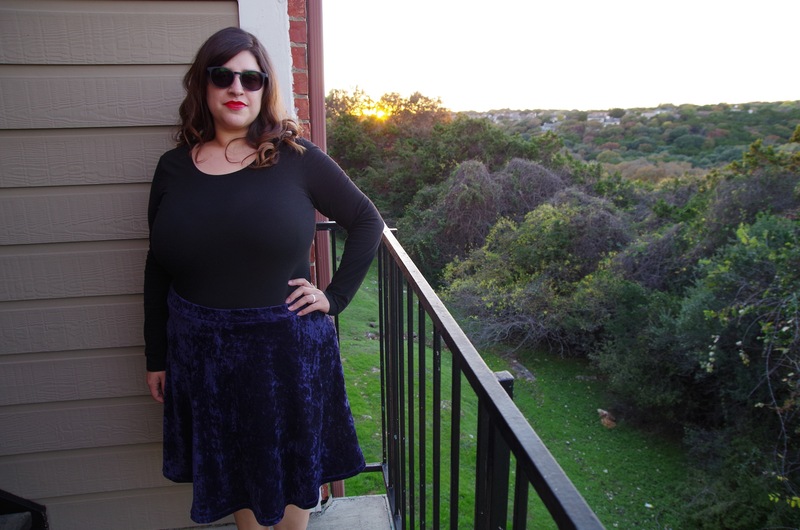 This is the first official one, the BlueGingerDoll Violet skirt. Made from blurple crushed panne, it’s soft, flowy and comfortable. I cut a size 20 but an 18 would’ve been a better fit for this skirt. I’m not too concerned about it, though. I spent about an hour and a half putting this together. Easy projects are the best! Christmas is approaching, which means I’ll hopefully be receiving some much needed sewing goodies (serger, dress form, more fabric!) so I’ll be able to teach myself more skills this coming year. I’m also currently sewing my first pair of Closet Case Files Ginger Jeans! So excited and nervous about the outcome. Beautiful fabric! It’s awesome when easy makes look so profesh when you pick the right fabric to work with! I really like the skirt, make me one the black.